If you are passing our building on the Queensway, have a look at the new additions to our building! 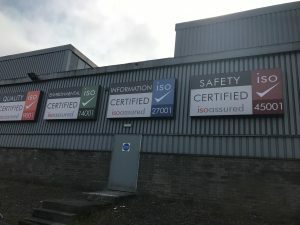 We have installed copies of our ISO accreditation’s to the wall on the outside of our building. This includes our most recent accreditation – ISO27001 – which assures our GDPR compliance standards and gives peace of mind to all clients who use both our shredding and recycling services.